Vereth is an Altmer patron of the Windpeak Inn in Dawnstar. 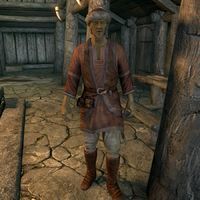 He is named in Azarain's Journal as a possible member of a Daedric cult due to the fact that he complains of the cold but is resolute in remaining in Dawnstar. You will be tasked with pickpocketing or following Vereth during the related quest to see if he will lead you to the Daedric cult. However, he is not a member of the cult, and you will need to follow Harald instead to progress the quest. Vereth disappears at the conclusion of the quest. This page was last modified on 20 January 2019, at 19:18.